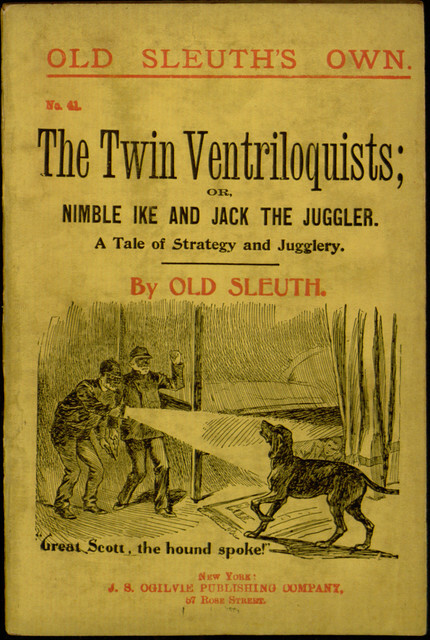 Another project has finished the proofreading process this week, and the title is a mouthful: The Twin Ventriloquists; or, Nimble Ike and Jack the Juggler: A Tale of Strategy and Jugglery. As the title suggests, this is the story of two ventriloquists who use their ability to project their voices as a means of fighting crime — a premise more recently used to humorous effect in The Voice segments of old-time radio parody Two-Minute Danger Theater, but here taken completely seriously. It should be clear from all of this that The Twin Ventriloquists is not a literary masterpiece for the ages. It is, at best, an interesting glimpse into the evolution of commercialized entertainment. Yet, for all that, when it concludes by promising that in a future volume, “our readers will learn the thrilling romance of the life of Nimble Ike, the most wonderful ventriloquist yet known in all the world, and also will be revealed the secret of the mysterious box,” there is a certain genuine temptation to read on and learn more. Who can resist a mysterious box? If you want to take a look for yourself, the entire volume can be read online or downloaded in a variety of popular formats through Project Gutenberg.